Interesting start with two boats barging in at the pin end of the line and a small collision but no damage so a quick tack away for the middle of the Solent. Single tack down the Solent to windward of most of the fleet with some really fluky wind shifts and tracked Raffles out of Hurst behind Black Diamond with the rest of the fleet behind. Kept our good position to Anvil Point but headed into the adverse tide as we rounded St Albans and the wind picked up. Had to change down to the No. 3, then back up to the No. 1 back down to the No. 3 and ended up with a reef as well. 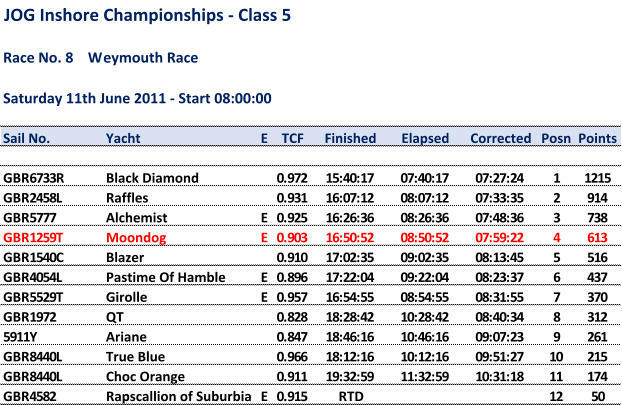 Might have done better if the wind had not picked up and just off the podium with a 4th. Interesting trip back with a forecast Gale 8 and they weren't wrong. Ended up with just a No. 4 as the wind gusted over 30 knots on a regular basis and nearly had the boat up the beach trying to tack coming up to Hurst Narrows but a quick blast of the engine averted danger.